When did you last see a dentist? Many of us will often neglect a regular visit to the dentist while trying to schedule our busy lives, but have you ever spared a thought for your dog or cat? Sadly, pet dental hygiene is often overlooked until their gum disease is well and truly advanced and as a consequence it affects over 80% of our canine and feline companions. Veterinarians regularly see pets with a wide range of tooth and gum diseases including periodontal disease, fractured teeth and oronasal fistulas. These are not only painful but can impact on their general health. Apart from the obvious problems inside the mouth, tooth and gum disease has been documented to contribute to a range of conditions including heart, liver and kidney disease. Periodontal disease is the most common condition affecting the teeth and gums. It is a term which broadly describes the inflammation of the gums, bone and soft tissues supporting the teeth caused by the accumulation of food, tartar and bacteria between the teeth and gums. We will also often see broken teeth as a result of trauma or chewing on rocks, sticks or even bones. In these cases infection can track up the exposed pulp cavity and cause an infection in the bone, what many of us may have experienced as a tooth ache. In severe cases this can develop into a swelling below the eye and even produce a discharging abscess. In most cases symptoms are not so obvious. Signs to watch for in your dog or cat are bad breath (halitosis), excessive drooling, reluctance to eat, red or inflamed gums, yellow or grey build up on teeth and matted fur or food stuck around the base of their teeth. Don’t forget to check their molars as these are the teeth you rarely see but are most commonly affected. 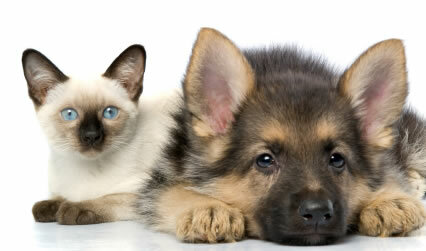 If you see any of these things then speak to your vet as Fido or Kitty will already have some tooth and gum disease. Prevention of dental disease and early intervention truly is better than cure. For ourselves this means regular brushing, mouth washes, healthy eating and of course regular visits to the dentist for a scale and polish. The same applies to our pets. Special dental diets such as Hill’s Prescription t/d® have been developed which are formulated to mechanically clean your pets teeth. Practicing basic oral hygiene for your pets will help reduce tooth and gum disease but just like us they need to have their teeth regularly scaled and polished.